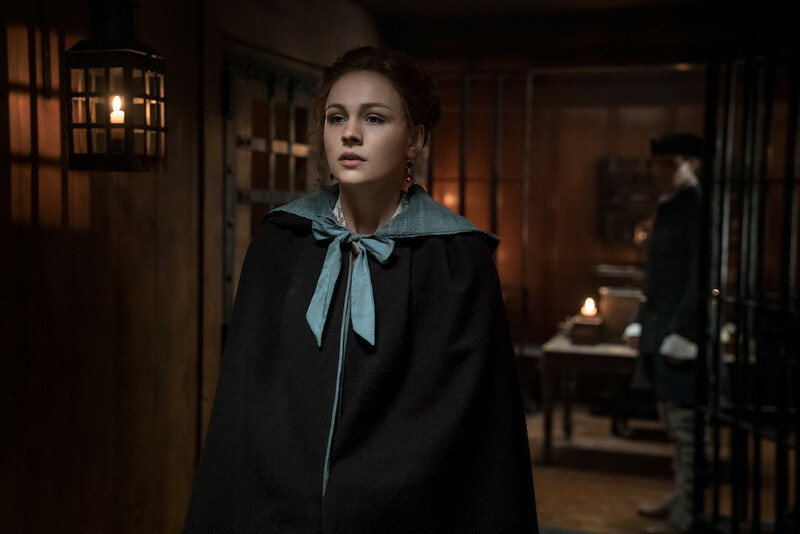 In Wilmington, while Bree confronts Stephen Bonnet in his last moments, Fergus and Marsali plan to free Murtagh. Meanwhile, at Shadow Lake, Roger is forced to weigh his faith in love. 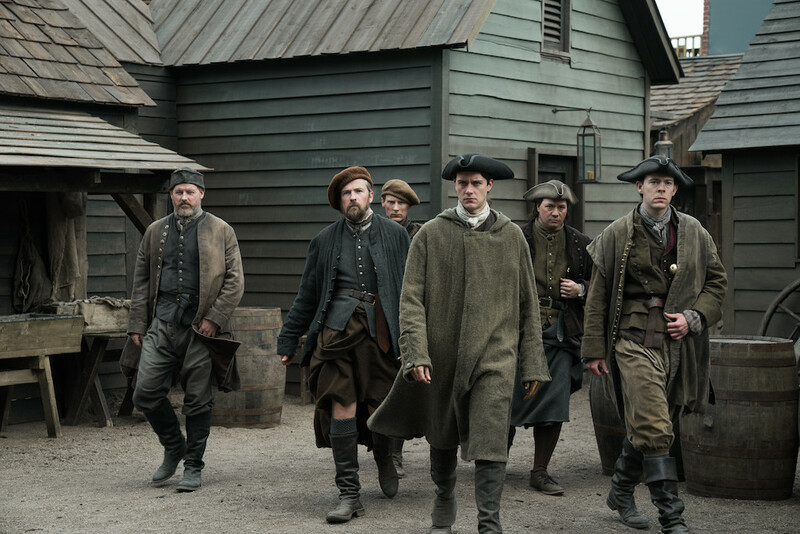 We review this week’s Outlander, “Providence”. 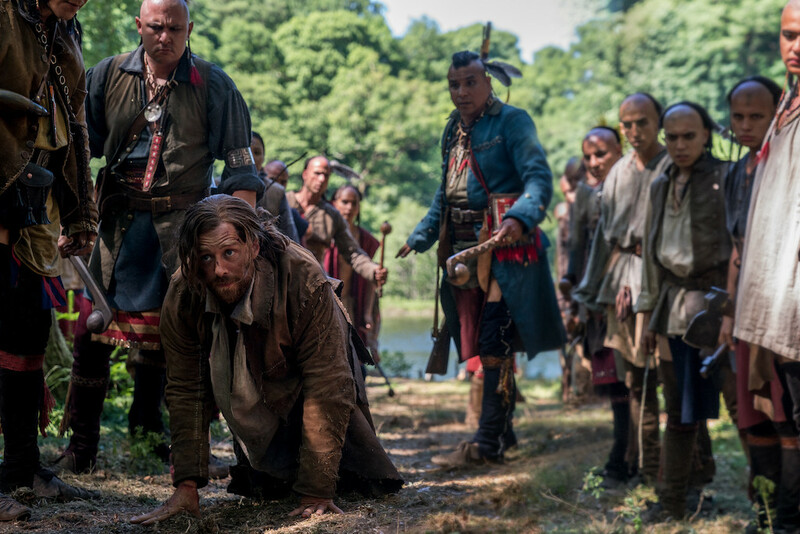 Meanwhile, after Murtagh is captured along with Bonnet, Fergus passes on the news to the other Regulators in WIlmington. They know that Murtagh will never get a fair trial, given Governor Tryon’s enmity. So, they quickly decide that the only choice they have is to try and free Murtagh from the jail. They can’t let Murtagh hang. Later on, Marsali comes upon Fergus as he’s working on the plan and (perhaps unsurprisingly) encourages Fergus. He’s shocked that she isn’t angry, but Marsali tells Fergus that she would face the devil right alongside him, if need be. Fergus says he wishes Milord was there and Marsali adds that she wishes Claire were there, too. After all, she broke into Wentworth Prison in order to save Jamie. If Jamie and Claire were there, what would they do? They decide to channel Jamie and Claire in order to find a way to save Murtagh. They decide it’s time to pack up and make their way to Fraser’s Ridge, too. As the jailer leads Bree and LJG to the cell where Bonnet is being kept, she tells Lord John that she wants to see Bonnet alone. Again, Lord John opposes the idea, but Bree assures him that since Bonnet is in chains, he can’t hurt her. LJG tells Bree that if she needs anything, he’ll be right there. As Bree proceeds down the corridor and into the cell, it’s dark and difficult to see. But soon she observes Bonnet chained and sitting on the floor. She asks him if he knows her, and Bonnet says he doesn’t know her name. However, upon a closer look, he says that he does remember her face, among other things. Ugh. Bree introduces herself as Brianna Fraser and tells Bonnet that her parents are Jamie and Claire Fraser, the people who saved him from being hanged and who he, consequently, robbed. Bonnet tells Bree that he remembers all this, and that if she’s looking for the jewels he stole, he already sold them in order to get a ship. Bonnet also says that the last time they met, Bree was interested in a trinket, a ring. And he knows that she got that back. Bonnet demands to know what Bree wants from him and she says she wants nothing, that she came to offer forgiveness. Bree then shows Bonnet her pregnant stomach and says that, if it would help him in his final moments to know that something of him will be left on this Earth, he’s welcome to the knowledge. Bonnet denies that he fathered her baby, saying many whores have tried to foist their children on him. But Bree says that she has no reason to lie. Bonnet then makes the comment that it’s good to know that even if he’s gone, he won’t be forgotten, and this enrages Bree. She promises to forget him, and that this child will never know who he is. She will do her best to raise her child to be a good person, all while Bonnet rots in the ground. Bree turns to leave, but Bonnet stops her. He removes a gem from his teeth and presents it to Bree. She should take it for the child’s maintenance. Bree doesn’t want to, but Bonnet insists, as a dying man’s last wish. She allows Bonnet to place the gem in her hand and then leaves. Bree, Lord John, Fergus, Murtagh, and company exit the jail and moments later it explodes. Fergus and Murtagh run to Marsali who is waiting with the baby and their belongings in a large wagon. While Fergus and Murtagh hide under a tarp in the back, Marsali guides them all out of town and on to Fraser’s Ridge. Bree and Lord John make their way to their carriage, but are stopped by an officer and militiamen. The officer just wants to make sure that they are OK, and LJG confirms that they are. The officer tells them that this was an attempt by the Regulators to free their leader and that they were successful. He asks Lord John if he or Bree heard anything about where they might be headed. You can tell Bree is a little concerned that Lord John might rat out Fergus and Murtagh. But LJG says that everything happened so fast, so no, he heard nothing. But he wishes the militiamen luck in their search. As Lord John and Bree turn around, she has a little smile on her face. All the while, at Shadow Lake, we see Roger complete the Mohawk gauntlet and there is even more violence and beatings. When Roger falls to the ground, Kaheroton and another Mohawk stop the others from continuing to beat him. They say, in Mohawk, that Roger will remain a captive. I guess that means he failed the test *sigh* A young Mohawk approaches Roger and grabs his beard, naming Roger, Ehhaokonsah. Over time, we see Roger become a servant/slave of sorts. He was harmed in the gauntlet, so he wears a sling, but that doesn’t stop the Mohawk from ordering Ehhaokonsah to fetch and deliver wood. Roger also continues to count the days by tying knots in that rope. One day, when Roger is told to deliver wood to a longhouse, he meets a Mohawk woman and her baby. The woman, a healer, stops Roger and speaks to him in French. Roger tells her that he knows French, and she offers him a remedy for the pain, telling Roger to chew it. Roger compliments her daughter, and she replies that the baby has her father’s eyes. Roger asks if she can help him escape, but she says no. He must take the time to hea. Kaheroton interrupts their discussion and forcefully tells Roger to be on his way. Kaheroton warns the woman, Johiehon, that Ehhaokonsah cannot be be good, after all, he was sold by his own people. Kaheroton gives Johiehon a trinket as a gift and she thanks him. She also tells him to remember that both peace and war begin in the minds of men. Inside the hut, Roger sees he’s not alone. There’s another captive, Father Alexandre Ferigault, who tells Roger that he’s in Shadow Lake in New York. He also tells Roger that Ehhaokonsah means Dogface. When Roger asks how he got there, Father Alexandre shares his story. As a priest he came to live among the Mohawk to spread the word of God. About a year into his stay, he fell ill with fever and thought he would die. However, he was saved by Johiehon. Over time, and despite his efforts to resist, he fell in love with her. They slept together and Johiehon got pregnant. Interestingly, the Mohawk accepted Father Alexandre, Johiehon, and the baby. The trouble came when he refused to baptize the child. According to Father Alexandre’s convictions, he broke his vows as a priest and has fallen out of communion with God. Therefore, he no longer has the authority to baptize. The Mohawk have locked him away and threatened beatings and even a death sentence if he won’t baptize his child. And yet, Father Alexandre refuses, even though he’s still deeply in love with Johiehon. In fact, while talking to Roger, two Mohawk men come, strip Father Alexandre naked, and take him away. In the evening the Mohawk bring Father Alexandre back, who is still naked and badly hurt. Roger tries to help him, but Father Alexandre can barely move. He has a terrible wound by his ear. Roger says a prayer while cleaning the wound, asking for relief. This rouses Father Alexandre. After drinking some water, Father Alexandre tells Roger that he has until the morning to baptize his child. If he doesn’t, the Mohawk will tie him up, light his feet on fire, and leave him there until he dies. Roger is completely baffled. The Mohawk don’t know the complexities of Catholicism. Father Alexandre should just give the sacrament! Father Alexandre refuses saying that he wouldn’t want to damn his child with a false blessing. Roger tells Father Alexandre that even if he just says a Hail Mary, the Mohawk won’t know the difference, but Father Alexandre is adamant. He will stick with his convictions… this is God punishing him and Father Alexandre will take the punishment. This seems to push Roger to the edge. Roger tells Father Alexandre his story: how he fell in love with a girl and proposed to her. When she denied him, he followed her across time and space to convince her to marry him. And on the night they were handfast, they got into an argument and he left. Still, he came back for her again, but was beaten by her father and sold to the Mohawk. Against all odds, he escaped his captors and found a way to go back home. Still, he hesitated because of his love for her and ended up as a captive again. Roger says he’s learned a lesson and refuses to continue to be an idiot. He’s going to look at for #1 and tells Father Alexandre that he should do the same. While the priest was away, Roger has been digging a hole to escape. They can escape, take Johiehon and the baby with them. Father Alexandre can have a good life as a husband and father. That has to be better than staying there to die. It seems Father Alexandre agrees because he starts helping Roger to dig. Make sure you live tweet with us each Sunday and catch our WSN REVIEWS series on YouTube after each episode!